The Canadian Foundation for AIDS Research is proud to announce that we, along with our event management partner ESP inc. and Seneca College’s Event Management program, have won the National Award for the Best Event of a High Profile Charity for Bloor Street Entertains 2017, with Signature Partner, BMO Financial Group. The Best Event award was presented during a ceremony at the new X Hotel at Exhibition Place on Wednesday, March 22, 2018. The award is part of the Canadian Event Industry Awards, presented by Canadian Special Events Magazine. 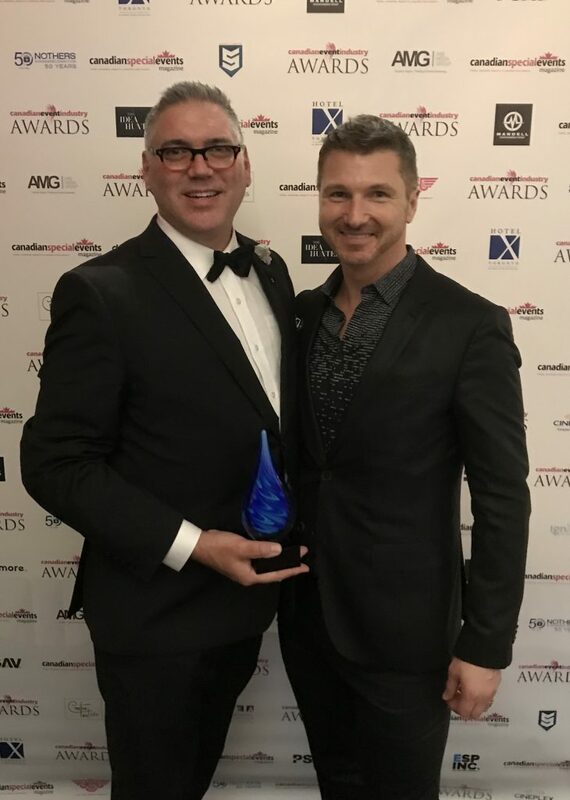 John Macbride, Professor and Program Co-ordinator for Seneca’s Event Management – Event and Exhibit Design, School of Fashion; and Chad Brincheski, Principal at ESP inc. holding the award. (absent from photo, Debbie Osske, CANFAR’s Director of Events, Stewardship and Volunteer Relations). Seneca has partnered with CANFAR on Bloor Street Entertains since 2006 when their Event Management program started. ESP inc. joined the CANFAR family in 2017, and this was their first Bloor Street Entertains as CANFAR’s event management partner. Co-Chaired by Mrs. Sylvia Mantella and Canadian model, Ms. Coco Rocha, Bloor Street Entertains 2017 brought together some of Toronto’s elite philanthropic community members to raise nearly $700,000 in support of Canadian HIV and AIDS research. “Thank you to both partners, ESP inc. and Seneca College, as well as our extremely generous venue, decor, floral, culinary, and photography partners who, year after year, work tirelessly to create Canada’s largest fundraiser in support of HIV and AIDS. The community of volunteers behind this event should be incredibly proud of this award and distinction,” said Kyle Winters, President and Chief Operating Officer of CANFAR. Each year, Bloor Street Entertains brings together the city’s finest culinary masters, luxury retailers, and creative florists. The evening begins with cocktail receptions hosted by some of Bloor-Yorkville’s most esteemed retailers. Guests then are treated to a four-course dining experience with tablescapes carefully crafted by Toronto’s most prolific floral and décor experts. The night culminates with the “BSE After Party” at the Four Seasons Hotel Toronto. Throughout the evening, guests have the opportunity to bid on expertly curated items in the Silent Auction.